Automation creates wealth by allowing us to do more work in less time. How can the industry use that wealth to foster human prosperity? Many of the great inventions of the last 200 years were designed to replace human labour. Tractors were developed to substitute mechanical power for human physical toil. Assembly lines were engineered to replace inconsistent human handiwork with machine perfection. Computers were programmed to swap out error-prone, inconsistent human calculation with digital perfection. These inventions have worked. We no longer dig ditches by hand, pound tools out of wrought iron or do bookkeeping using actual books. The advancement of automation is progress in many ways, but maybe the most valuable progress is not the obvious (mechanical) ways? It is said, with some authority, that 600,000 of the current 2.2m positions in the construction industry could be automated by 2040 as the so called “Fourth Industrial Revolution” turns the sector on its head. Many construction jobs could be eliminated over the next two decades as advances in robotics and digital technology mean human builders are replaced. Machines have been developed to increase efficiency in tasks like brick laying. Although residential construction has been slow to adopt technology and change, robotics in brick laying - along with other digital technology should be a serious consideration. But even if our machines increasingly do our work for us, it doesn't always follow that labour becomes redundant or our skills obsolete? In the 45 years since the introduction of the automated teller machine (ATM), those vending machines that dispense cash, the number of human bank tellers employed has roughly doubled. Which raises an intriguing question: what are all those tellers doing, and why hasn't automation eliminated their employment by now? ATMs replaced a lot of teller tasks. But those tellers ended up doing somewhat different work. As their routine, cash-handling tasks receded, they became less like checkout clerks and more like salespeople, forging relationships with customers, solving problems and introducing them to new products like credit cards, loans and investments: more tellers doing a more cognitively demanding job. There's a general principle here. Most of the work that we do requires a multiplicity of skills. In general, automating some subset of those tasks doesn't make the other ones unnecessary. In fact, it makes them more important. It increases their economic value. Here's the broader point. ATMs could do certain cash-handling tasks faster and better than tellers, but that didn't make tellers superfluous. It increased the importance of their problem-solving skills and their relationships with customers. The same principle applies if we're building a building. As our tools improve, technology magnifies our leverage and increases the importance of our expertise and our judgment and our creativity. Jobs that people do will be important. They can't be done by machines, but they still need to be done. But that doesn't tell us how many jobs there will need to be. Sure, technology can eliminate jobs, but automation creates wealth by allowing us to do more work in less time. There is no economic law, however, that says that we will use that wealth well, and that is worth thinking about. 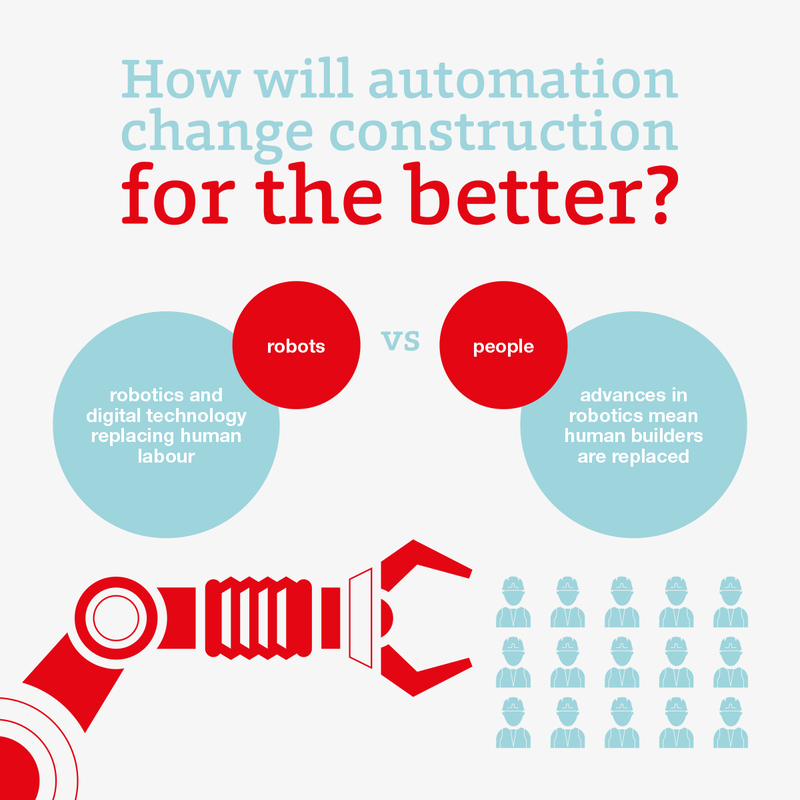 This is the challenge that automation poses for construction. How does the industry reap the harvest of its technological prosperity? In the next few years, construction labour employment is likely to fall significantly, purely due to rising productivity - through automation. What do you think the remaining workers are going to do?" We hope that construction finds something remarkable to do with all of that prosperity.